The first step in applying new caulk around the seams of your bathtub is to remove the old caulk. Without complete removal of the old caulk, new caulk cannot form a tight water seal, and without that water seal, moisture seeping into the wall around the fixture can eventually destroy a tile job or wallboard surfaces. This article will offer several tips for easily removing old caulk of any type and on cleaning preparing the surfaces for an application of new caulk. Old caulk can be laboriously pried away and scraped by hand, but an easy way to start the process is to use a ​caulk removal solution, such as the products made by 3M, DAP, and others. 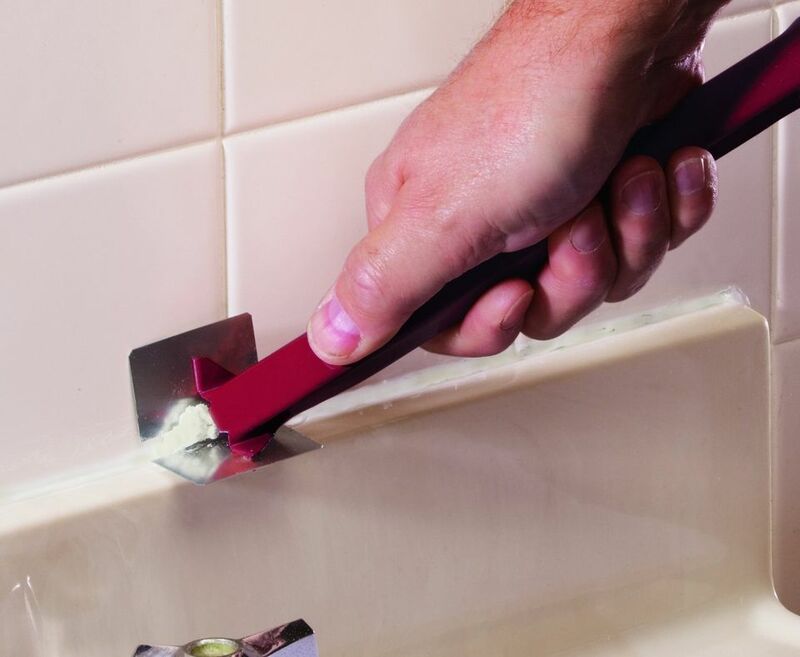 This chemical remover destroys the bond between the old caulk and the tile, tub, or sink, making it very easy to pry out of cracks and crevices. A small bottle of liquid caulk remover costs less than $10 and will remove about 20 linear feet of caulk—enough for most bathtubs. Squeeze remover onto the old caulk making sure to cover the old caulk completely. Let set as directed by the product's label instructions. Some users report that it helps to allow the product to set overnight for maximum effectiveness. Using a plastic putty knife or a caulk removing tool (see next page), scrape the old caulking away. It will come off in chunks or may pull away from the wall in a long strip. Scrutinize the seams and use the plastic putty knife or scraper to remove any visible debris remaining. Use a clean cloth moistened with alcohol to clean the surfaces thoroughly. Let the surfaces dry completely before applying new caulk. Several manufacturers make caulk removal tools, sometimes as part of a kit that includes tools for applying and smoothing new caulk. The better tools are made of plastic that won't scratch surfaces and have angles and blades designed to scrape caulk out of narrow crevices and corners. One excellent tool from Hyde has a corner scraper that also scrapes the sides of the joint with a hardened plastic edge that won't damage the finish surface of the tile, tub, or sink. These tools can be used by themselves with patience, but they are also great as the second step after applying chemical caulk remover. Make sure to scrutinize the joint to ensure you've removed all the caulk. Before applying new caulk, clean the surfaces thoroughly with a clean cloth moistened with alcohol; let the surfaces dry completely before applying new caulk.